Ready or not, 2017 is almost over – where does the time go? While some folks are anxious to start anew, I like reflecting on the past year. So before we break out the resolutions, I’d like to look back on the incredible year AT&T has had strengthening our bond with the LGBTQ community. I joined AT&T at a time when the organization was still trying to figure out how to respectfully and authentically prove itself as a strong LGBTQ community ally. It was my job to survey the landscape, assess our opportunities and growth areas, and chart a path forward for AT&T to engage with the LGBTQ crowd. I was encouraged by the fact that AT&T has long been a supporter of the community. In 1975, AT&T became one of the first major American corporations to ban discrimination against employees based on sexual orientation. In 1998, AT&T adopted one of the first domestic partner benefits programs for LGBT employees. In 2006, AT&T was one of the first U.S. corporations to offer transgender-inclusive health care benefits. My colleagues in Diversity & Inclusion, External Affairs, Public Relations, and others, share my passion for the LGBTQ community. Over the years, we’ve each built strong relationships with different nonprofit organizations, community leaders and allies, and encouraged investment in the community. This year, so much of that work seemed to bear fruit all at once. I’ve never been more proud of our collective work in the LGBTQ space. Last month, the National Gay and Lesbian Chamber of Commerce (NGLCC) awarded AT&T its Corporation of the Year. The NGLCC honors companies that consistently support the LGBTQ community. This includes equal opportunity for LGBTQ suppliers, customers and employees. We were honored and humbled to be recognized for our hard work. The only person possibly more excited about this honor than my friends in Diversity & Inclusion and External Affairs was our new Chief Diversity Officer Corey Anthony. We also earned a 100% score on the Human Rights Campaign Foundation’s Corporate Equality Index (CEI) for the 14th consecutive year. This set us apart as one of HRC’s Best Places to Work for LGBTQ employees. 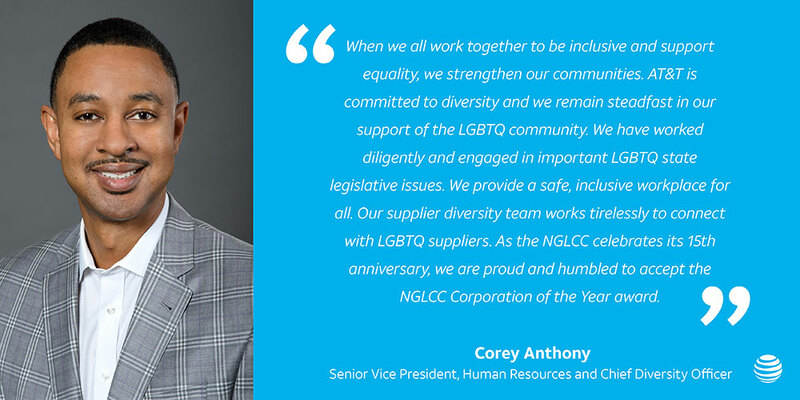 Like the NGLCC honor, our HRC CEI score came from our commitment to equality in and out of the workplace and our strong support of the LGBTQ community. We also grew our signature LGBTQ campaign, Live Proud, this year. We worked with GLAAD, the world’s largest LGBTQ media advocacy organization, on our 5th annual Live Proud campaign. It ran at the height of Pride season. We challenged LGBTQ members and allies to proclaim, “We Are Bold” and share how they stand tall in their truth. And with the help of our Live Proud followers, we helped raise $50,000 for GLAAD. The campaign even earned AT&T an ANA Multicultural Excellence Award nomination for LGBTQ marketing this year. But the biggest success of Live Proud was how we kept the fun going long past Pride season, beginning with Live Proud on Campus. Live Proud on Campus was our first-ever scholarship contest for LGBTQ college students and allies. We asked students to upload a video pitch of a project they would complete at their schools if awarded the prize money. In the end, 3 grand prize winners took home a $10,000 scholarship, $2,500 to fund their campus initiative, and a semester-long mentorship experience with the Human Rights Campaign (HRC). We also provided HRC with a $25,000 contribution to help further its mission of equal rights for all LGBTQ people. Live Proud also got in the yuletide spirit with our first-ever Live Proud Holiday initiative. We worked with True Colors Fund, a nonprofit organization dedicated to ending LGBTQ youth homelessness. Music icon Cyndi Lauper—and one of my favorite artists—hosted True Colors Fund’s annual benefit concert in New York City on Dec. 9. As title sponsor, we held a nationwide sweepstakes for a lucky winner and 3 friends to fly to see the concert. Another major milestone this year was the 30th anniversary of LEAGUE at AT&T. It’s one of the oldest LGBTQ employee resource groups (ERGs) in the country. We celebrated in Los Angeles this summer with a day full of food, fun and fellowship, followed by an incredible reception. LEAGUE at AT&T’s best days are still ahead and we can’t wait to see what they’ll achieve in the next 30 years (and beyond). As with any new year, there’s excitement and hope. But if 2018 is anything like 2017, it’s going to be another banner year for AT&T and our LGBTQ community partners and friends. I, for one, can’t wait. Happy Holidays and have a Happy New Year, everyone. For more on AT&T’s commitment to diversity and inclusion, go to about.att.com/sites/diversity.